Secret Gardens are the most tranquil of outdoor rooms or outdoor living spaces. You can unwind after a hard day at work, enjoy coffee in the morning before starting your day, or just sit and read a good book,in the shade of your very own secret garden. 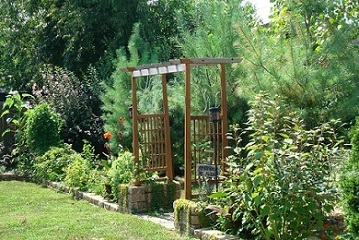 Get more information on the correct type of plants to grow in shade gardens here- http://www.gardeningwithjulie.com/shade-garden.html Try adding decorative accents for lots of added interest, checkout the link to ebridges below for beautiful curved bridges for your secret garden. The photo above shows our secret garden the way it looks now. This area of our backyard has changed over the past 4 years. We originally just wanted to add more privacy and hide the undesirable view beyond the height of the back fence. We added a row of 4 white pine trees about 10 away from the fence line. Then we added hybrid poplar trees near the fence line. We already had tiny Rose of Sharon bushes at the fence. The poplar trees were spaced between the Rose of Sharon bushes. There was a forsythia bush in the far corner to the left. Today it is huge and takes up the entire corner space. It reaches several feet above the fence line and aids in hiding the view from that end of the property. The view beyond our privacy fence is not something we enjoy looking at on a daily basis when we are outside. So the poplar trees would grow faster than the pine trees to speed up the wall we wanted to create. The pine trees will remain green all year so we will have a better view year round soon. At this time they are already several feet taller than the fence. The privacy fence is 6 feet tall. 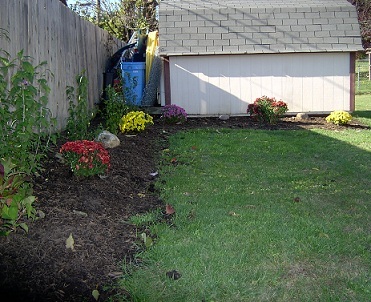 That evolved into adding a border in front of the pine trees to make a flower garden space. This border matches an existing wall we have in our backyard. We added topsoil to fill. Then we later added a pond in the center of the space, and lots of hostas. 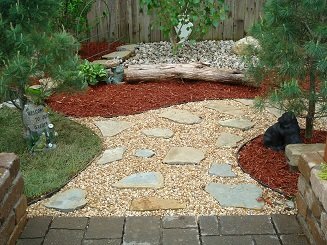 The area was originally covered in small rocks at the fence line and pine needles in the other spaces but the pine needles did not stay in place with the wind and our dogs so we added mulch and grass. The last addition was the patio at the end of our secret garden, next to the garden shed. 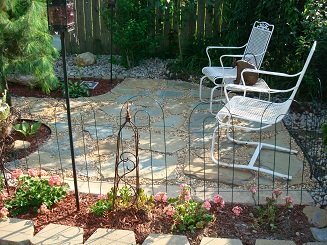 This small intimate patio space is perfect for the 2 of us and our 2 large dogs. We place 2 or 3 chairs and a small table in the area. It is surrounded by a variety of the trees mentioned above and includes a weeping cherry tree in the back corner. The front corner has another type of evergreen. The photo above shows the entrance path that leads to the patio area of the secret garden. This was made out of natural stone we collected and pea gravel. The patio blends perfectly with the path. You can see the dog statue on the right and the frog statue on the left. The dog statue is 2 black dogs playing. 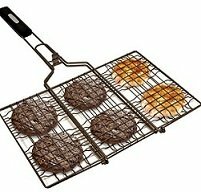 That was a fathers day gift from me to my husband a few years ago. We have several pets and the statue is a symbol of our love for our pets. We consider our pets our children. Our real children are all out of the house now, living their own lives- but these precious babies are very dependant on us. We just got 2 gorgeous gray long haired kittens that are the newest additions to our family. We have another white dog statue in the other part of the secret garden that honors a beloved dog that passed away. There is a cat watering can on the table. (See photo of patio). So go ahead and have treasures in your outdoor spaces that remind of pets or people that are special to you. It is comforting and that is the main reason for creating a relaxing outdoor room. The picture above shows the patio area of the secret garden. This was right after we finished it. This year I planted some annuals and perennials in the surrounding areas. The wire fence was temporary to keep the dogs off of the flowers. We have a variety of perennial flowers and annual flowers planted within the space. There is alot of shade in the area now so shade loving plants do well, but I can still have good success with some sun to partial shade varieties too. Find out more about perennials and annuals for your secret garden here. 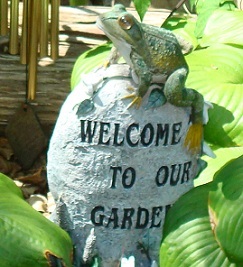 The photo above shows one of 3 frogs that welcome guests into our secret garden. We have a pond in the area so frogs are a perfect companion. One frog has relax printed on it's stone and the other one says dream. I think life is to short to be serious all the time so I enjoy adding some fun touches to all of my garden spaces. We have inspirational items in the area too. The photo above shows one of the inspirational stepping stones we have in our secret garden. 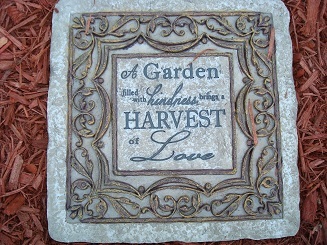 A Garden filled with kindness brings a harvest of love -is written on the stepping stone. I hope this secret garden project will inspire you to add one to your garden. Listen to the sound of windchimes as you relax in your secret garden retreat! 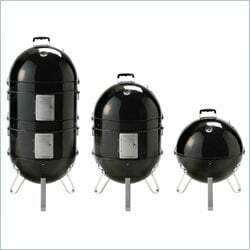 Shop from the link below for a great price and selection.